The House Education Committee released a draft proposal Thursday morning that, if passed, would significantly change the structure of Vermont’s schools. 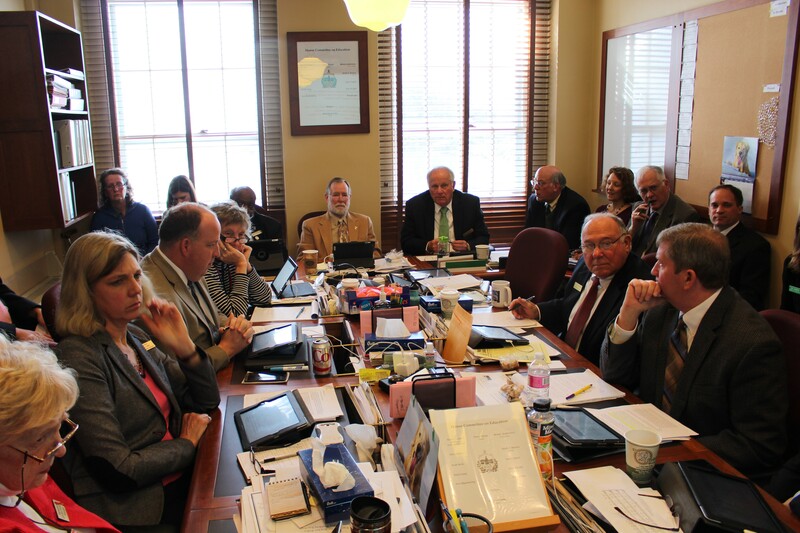 A 27-page bill unveiled in the committee provided an indication that long-debated changes to Vermont's education system may indeed come to a vote by the end of the session in May. Committee chair Dave Sharpe (D-Bristol) said that while he expects his members to amend the proposal, he wanted to set a framework for discussion. “I felt pressure to get a bill on the table,” said Sharpe, who expressed confidence that his committee would send the bill to the House floor by mid-March. “This is really just step one out of the gate,” said Rep. Ann Manwaring (D-Wilmington), who serves on the panel. Sharpe said he expects the committee to consider an additional tax proposal by Rep. Oliver Olsen (I-Londonderry) that would shift more of the balance for education funding from property to income taxes. House Speaker Shap Smith (D-Morristown) said he favors changes that reflect residents’ ability to pay, but he has expressed concerns that income is a less stable source of revenue than property. Sharpe said the bill, which incorporates some of the 100-plus ideas the committee has received, was written in consultation with Gov. Peter Shumlin’s staff. It proposes some dramatic changes, particularly for small schools, though not as dramatic as those pitched by Shumlin in last month's budget address. Education Secretary Rebecca Holcombe has proposed that schools undergo educational quality reviews. Those that don’t meet such standards as per-pupil costs could face intervention or eventual closure by the state Board of Education. That kind of talk was absent from the House bill unveiled Thursday, in part because Shumlin’s proposal lacked the money to pay for staff to conduct those reviews. Holcombe said Thursday that the House bill is a good starting point. “Our hope is to have a good conversation that will hopefully address concerns about cost," she said. A significant reduction in the number of school districts. By July 2018, the state's 277 districts would be replaced in function by its 67 supervisory unions, unless a district came up with its own plan. Holcombe said creating fewer, larger school districts will allow for greater flexibility and efficiencies. Instead of conducting dozens of audits for federal funding, for example, only one audit would be required. Phasing out small school grants that many small school districts rely on as enrollments decline. Reducing reliance on “phantom students” or assistance the state provides to schools to decrease the impact of sudden declines in enrollment. A simplification of education tax rates designed to make clearer to voters how their property taxes would be affected by the budgets they approve on Town Meeting Day. A moratorium on legislation that would increase education property taxes through July 2016. Any bill that the legislature’s Joint Fiscal Office determines would increase taxes would be automatically withdrawn and could not be approved by any committee, the House or the Senate. A ban on paying tuition to send Vermont students out of state, with exceptions for interstate school districts and other border community situations. Committee members said they want to hear more details about how the proposals will affect various districts around the state. Sharpe said that the proposal would curb rising education costs by consolidating administrative functions. A similar effort proposed last year was projected to save $30 million a year, Sharpe noted. His committee expects to gather more information in the coming weeks about projected savings. “There are provisions here that will bend the cost curve and making voting at town meeting easier,” Sharpe said.